It is amazing to hear some of the blow back from the Packers loss last Sunday. Twitter has blown up asking, no, demanding Mike McCarthy and Ted Thompson be fired. “Mike McCarthy can’t call plays” and “Ted Thompson can’t build a team” are phrases bouncing all over the place. Packer Nation, take a deep breath. Let’s dive a little deeper into the game. First of all, the play-calling is not to blame. Mike McCarthy obviously called for Johnathan Franklin to fumble on 4th and 1 (insert eye roll). The play calling is not to blame, the Green Bay Packers did not get the luck of the bounce and that play helped decide the outcome of the game. The final 4th down play should have been effective, it was the left tackle who did not complete his assignment. Bakhtiari should have taken Michael Johnson to the ground with his block, however he missed his block and Johnson was able to block the pass. Again, not play selection, execution was the issue. Aaron Rodgers needs to be better. The Packers are going as far as Rodgers takes them, plain and simple. Aaron Rodgers has spoiled Packers fans with amazing play since he has become the starter. Fans really need to appreciate the level he plays at day in and day out. All that being said, Rodgers had a sub standard game and the Packers cannot afford sub standard. The first interception was not Rodgers fault. James Jones needs to finish running his route and he just gave up. The second interception was on Rodgers. That throw needs to be put in a spot where only Cobb can catch the ball or it will go out of bounds. Rodgers needs to lead the team to victory, but the blame should not be put squarely on Rodgers shoulders. The team needs to execute and finish the game strong. The Packers need to be able to take advantage when they get good field position. The game was not lost when Franklin fumbled, it was lost during four series in the 1st and 2nd quarters. 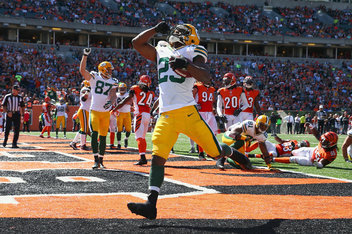 Four consecutive series the Packers had amazing field position: GB 42, CIN 26, CIN 37 and CIN 21. The Packers wound up with a grand total of six points from those possessions. If this team is going to make a run at the postseason, the team needs to be held accountable for it’s execution, or lack there of. Finally, some good news, the bye week has arrived! When the Packers schedule came out, many fans were outraged by the week 4 bye. Fast forward to present day and the bye week could not come at a more perfect time. The list of injuries is a mile long, now add Finley with a concussion, Starks with a knee and Matthews with a hamstring. The Packers should be able to get healthy and start to make a run. Morgan Burnett and Casey Hayward should be back to shore up a depleted secondary. The running game will have a version of Thunder and Lightning with Lacy and Franklin. Good things are coming Packer fans! The Packers will regret letting this game slip through their fingers, but this is not the end of the season. Also something to consider about Rodger's against Cincinnati. If most teams get below average output from their QB they get blown out on the road, Rodgers is below average and Packers still had a good shot at winning. Its a long season, Packers will be just fine. Need to play best football in November, December and January anyways , not September.